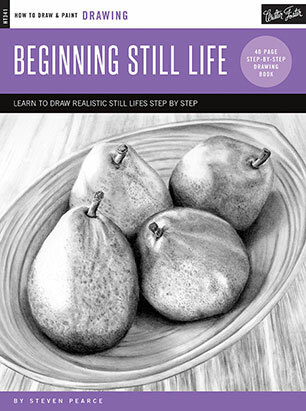 Designed for the absolute beginner, Beginning Still Life offers an introduction to basic drawing techniques and features artwork that will encourage and motivate the novice artist. Beginning Still Life teaches aspiring artists everything they need to know to get started in drawing with graphite pencil. From choosing paper and pencils to basic pencil techniques to composition and development, this book is bursting with valuable lessons to help beginning artists master this captivating medium. Talented artist Steven Pearce guides the readers through an exploration of pencil drawing, covering basic concepts and techniques, such as value, shading, blending, setting up a still life, and more. Building on these basic techniques, artists can further practice their craft with step-by-step drawing projects that cover a variety of still life subjects, including fruits and vegetables, flowers, and more. With comprehensive instruction and artist tips and tricks, Beginning Still Life is the perfect resource for aspiring artists.